Who doesn’t like yard sales? It’s such a great way to make some quick cash and get rid of clutter at the same time! But in my mind, preparing for a yard sale is a process …if not an art. At my most recent yard sale, I made $1,013.00! Proof that if you take the time — and price things right — you can make a lot of money from a yard sale. Each time I have a yard sale, I fine-tune the things I’ve done in the past and make mental notes of the things I want to do (and not do) at my next yard sale. By learning from your own past yard sales, others who’ve hosted yard sales, and by listening to the shoppers who visit your garage sales. In time, you will begin to see what works and what doesn’t, and you will inevitably find shortcuts & time-savers that will result in even more yard sale profits. What? You say you don’t have the time to do all of this research yourself? Good news! 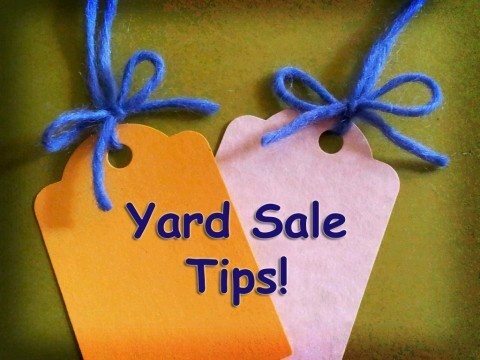 I’ve done much of the legwork for you, and compiled all of my findings right here in this multi-part article series that I’ve entitled, “All My Best Yard Sale Tips”. How To Prepare For Your Next Yard Sale: 5 Things You Need To Do Now! How To Make Creative Yard Sale Signs… That Work! I share garage sale tips from others on my Pinterest yard sale board.